I always enjoy returning to the HCT colleges in Abu Dhabi to conduct the yearly workshops for the graphic design students at the Women’s college. With the first and second year students, I give a one week workshop offering introductory design courses that are essential skills in my opinion for any designer aiming to work in the Arab world. The first workshop focuses on creating Arabesque patters and on exploring the art of creating Arabic geometric patterns. 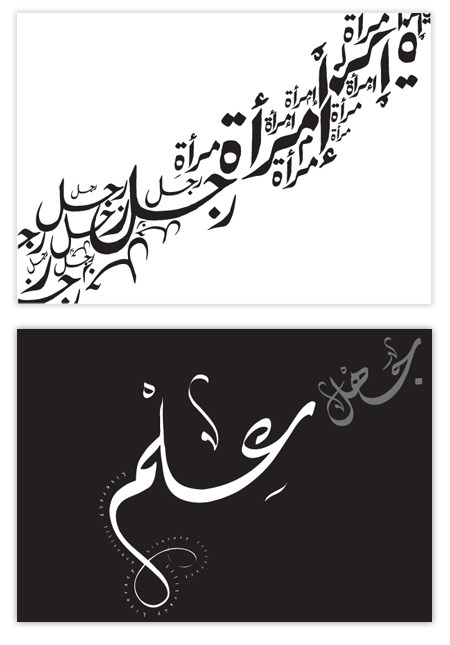 The second workshop consists of an introduction to the use of Arabic calligraphy in design. Students are taught a basic overview of the general Arabic calligraphic styles and are then asked to find local calligraphers in Abu Dhabi: Each student will brief the selected calligrapher and art direct his process, to eventually use the commissioned artwork in a printed piece the student will design. Besides enjoying the final work developed by the local students, it is always exciting to discover through the students some of the hidden talented Arabic calligraphers in Abu Dhabi, and encouraging the students to bridge a working relationship with them.